Being a writer, of course, I’m partial to words, but I will concede that some of the most breathtaking books I’ve spent time with had little to no writing at all. So it seems only fitting that there be a section of Other Cool Birds devoted to Illustrators (under that classification, you’ll find birds created using traditional and also digital methods, some hatched using one specific technique, others through mixed media). Spend a little time here and you might just remember what it felt like to believe anything is possible. You might just remember how to fly. Visual art is its own language, one that allows people to communicate and connect, people who might not otherwise understand each other. The work of Bulgarian designer and artist, Alexander Skachkov, is proof. Alexander informed me that he’s not fluent in English and I don’t speak any Bulgarian at all, so carrying on a conversation at length is not a viable option. There are actually a few other artists on Other Cool Birds who don’t speak much English, and I’m afraid I don’t speak Bulgarian or Lithuanian or Afrikaans or Japanese or French . . . or any other language fluently at all. And yet, I feel very connected to these people thanks to their remarkable art. 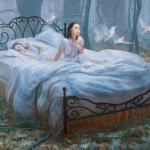 There is usually some element to their respective visual art that allows me to connect on a deeper level than I can with spoken words. Whether it’s the colors they use or the characters they bring to life or the story they tell, I’m often able to establish an emotional connection. The moment I came across Alexander’s art on Pinterest and Behance, and then on his website, I felt like I was spending time with a kindred spirit – someone with a rich imagination and an interest in unique, often misfit characters. Someone who is a storyteller. A graphic web designer and visual artist for more than 15 years, Alexander’s work is colorful, cool, and a bit Wonderlandish at times. ”Fishing” is a great example of character and story, with the man asleep in a boat that barely holds him, the water is angled suggesting that his peaceful snooze might be coming to a sudden end, the old toothy shark closing in, but look at that shark’s face. The wrinkles, the nose, the almost human-like features which make it much more interesting than if it was just another shark lurking in the deep. Much of Alexander’s art has fairy-tale qualities, and some is more steampunk. He offers a fascinating mix of nature and humanity with neither being quite what we’ve come to expect in the real world. I think it’s the playful imaginings and the, at times, bizarrely cool characters that appeals to me most (like “Unicorn,” “Mr. Pumpkin,” “Thief,” “Blue Bird,” and “Bird” found in the slideshow at the bottom of this page). “Bird,” for example, is not only colorful, but if you look closely you’ll find that the trunk from the elephant being transported has become part of the bird which is quite fantastical. And Alexander’s “Unicorn” resonates with me strongly because of just how un-majestic it actually is, how imperfect. His characters seem to possess an oddball, misfit sensibility that I love! To see more of Alexander’s wonderful art, visit his blog here. A student at Scripps College in Los Angeles, Maya Espiritu is a young Vietnamese American artist who has been interested in art since she was in preschool where she spent most of her time at the drawing/art table. Her art is full of color and reflects her fun, playful personality. 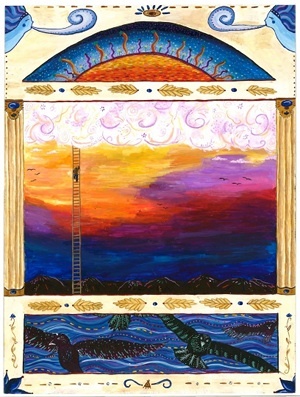 One of the things I most enjoyed about Maya’s “Climbing the Skies,” which appears here, aside from the beautiful colors of the center panel in particular, is the number of stories that immediately started firing off in my mind as a result of the individual panels and also as a result of the three panels working together. She admits to being impatient to start painting which is why her least favorite part of the process is planning and sketching out the idea. “I most like the actual painting of the art piece/illustration,” she says, and how she gets so “intensely focused” on the painting that she loses time. Click on Maya’s Other Cool Bird to visit her main website and enjoy some of her other art. You can also find her on Pinterest and Twitter. Lauren Gallegos is a member of the Society of Childrens Book Writers & Illustrators (SCBWI) – it was on the SCBWI website that I first came across her work – only while I’m a writer, Lauren is an illustrator. A very talented one at that! Interested in art since high school, Lauren Gallegos started college majoring in graphic design before realizing that she was interested in creating a visual narrative. She realized that she had something to say which led her to pursue a degree in Illustration. That intention resonates with me as does the fact that “Zulu,” her very cool bird, represents “the quiet side” of Lauren and serves as motivation for her to “speak up,” to use her wonderful voice. Lauren’s illustrations have a playful feel, but one of the things I enjoy most about them is the personality of her characters. Within an instant of viewing her work, you get a sense for who the characters are and what attitudes they might have. I find it interesting that Lauren claims to “love and hate the process of designing a character and creating a whole world for them to live in.” She loves it because of the endless possibilities, and hates it because despite anything being possible, she has to stop at just one idea. “It’s like meeting a new person,” she says, “and going to a new place.” It’s that way for anyone who views her work as well. Here’s to visiting more new worlds and meeting more new characters with Lauren. To see more of her work, visit her website here or click on her bird, Zulu. You can also follow her on Twitter and Facebook. If you spend a little time with her portfolio, you’ll find a combination of elegance and charm, of magic and playfulness. Her characters have personality. They have attitudes – not in the contemporary sense of copping an attitude (though a few may fall into that category), but in the sense that they’re not merely illustrated representations of imagined, lifeless people. This trait, it turns out, is especially important when illustrating books and it reflects Joan’s love of designing characters and of trying to create pictures that truly interpret an author’s words. For her, the story is the thing. “I want to tell a story,” she states. “I want to make an emotional connection between the viewer and the picture. I always try to leave lots of room for the viewer to fill in the blanks and interpret the paintings in her own way.” Even without any words accompanying them, Joan’s work makes for some delightful stories. 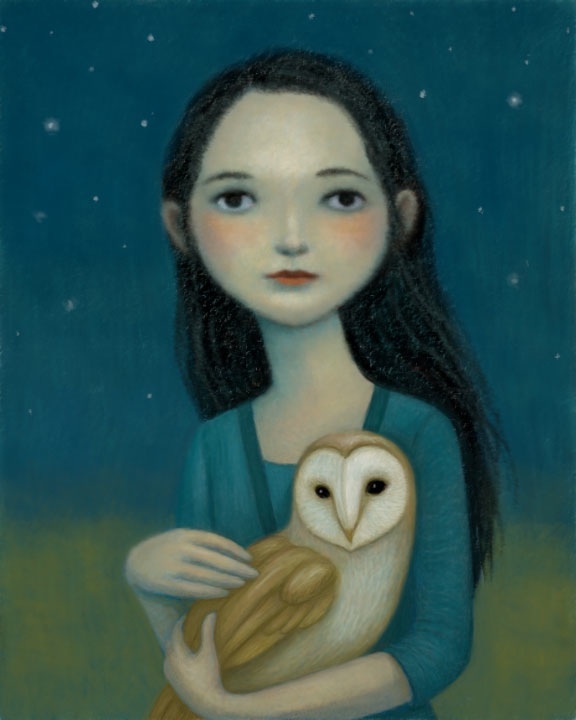 Technique: Although Joan works in pencil, pastels, acrylic, and other media, “Nightowls” was created in Photoshop. Click on the bird above to fly silent as an owl over to her website and be sure to check out her blog, Illustration Matters. You can also find out more about Joan on Facebook and Twitter. When I first encountered the art of Greg Marathas, I was immediately hooked by the nostalgic feel and the playfulness. 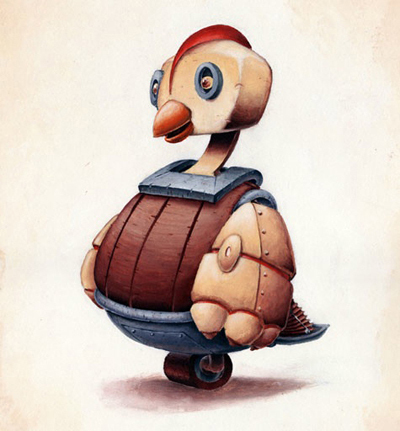 In particular, I was drawn to a few pieces that combined elements of rustic life (living on a farm or in a small town) with technology, in some ways blending the past and the future, into wonderful mechanical creations (like the mechanical bird here and a giant robot made from a barrel, and a mechanical horse that resembles a chariot of sorts made from spare parts one might find strewn about a barn, ridden by young daredevil). And that early experience influences him as well in his desire to create something that might inspire someone just starting out. “I like the idea of creating something,” he says, “that (if I’m lucky!) will make it’s way in front of someone who’s picking up a pencil and drawing for the first time, and hopefully that helps encourage their creativity in return.” Of course, another reason why Greg illustrates is because, like me, his head is endlessly filling with stories he has to get out. Technique: Greg’s “Mechanical Bird” is an oil painting. Although he works in digital media as well, he enjoys returning to the hands-on or kinesthetic aspect of painting. Whoever said coloring is for kids must not have encountered the wonderful, whimsical, subtle, yet profound art of award-winning author and illustrator Molly Idle. After looking at her wonderful illustrations, you might be surprised to learn that Molly only works with pencils. Once she creates a sketch she likes, she reproduces several copies and begins experimenting with color. For example, the green skin of Rex in Tea Rex is really layers of eleven different colors. With books like Zombelina, Tea Rex, and Flora and the Flamingo, Molly has been capturing the hearts of children and parents, as well as editors and award committees, with good reason. I mean, a zombie ballerina, how cool is that? And the story of Flora (a Caldecott Honor book) is told without any words. That takes a special touch. I find Molly’s work like one of those treats you sometimes think you need to sneak late at night when no one is around to catch you, not because you aren’t supposed to be enjoying it but simply because it’s so delightful it feels like a very special secret. That’s one of the reasons I reached out to Molly. Of course, she’s hardly a secret. I don’t mean that. But she is one of those treats people may have heard of, but haven’t had the chance to appreciate for themselves. I wanted to give them another chance, another venue where they might come across her work. Molly started her career as an animator for DreamWorks (not a bad starting point) and when she approaches the creation of a new book, she thinks about it the same way she would when staging a film. “Whether it’s on film or in a book, it’s about finding the right image that captures your imagination — and a moment of time.” Maybe that’s another reason her work resonates with me so much, my love of movies. Working in animation was all Molly ever wanted to do. “Drawing all day. 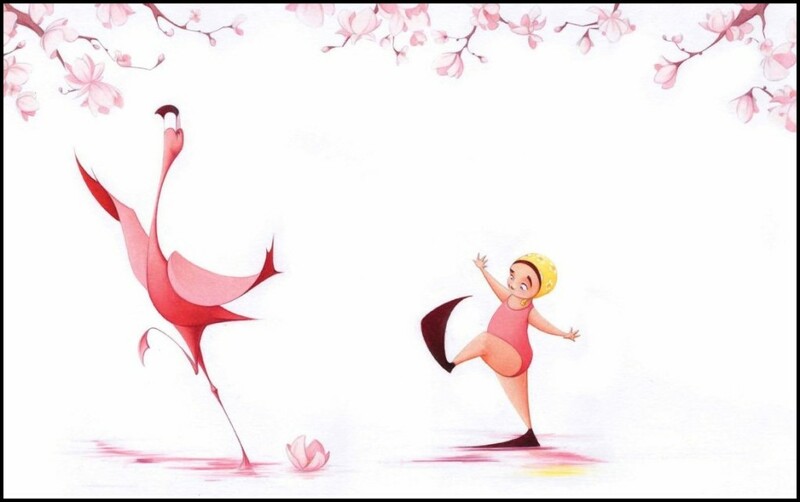 It doesn’t get better than that!” But after DreamWorks decided to focus strictly on digital animation she lost some of the passion she got from working with pencil and paper. 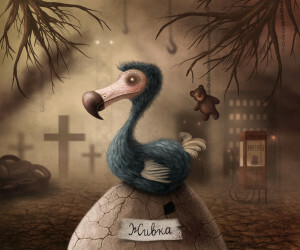 As a result, she left the company and entered the realm of children’s book illustration. As much as I love movies, I’m glad she’s sharing her talents (as a visual artist and a storyteller) with kids. Click on Molly’s bird to fly over to her website. And visit her blog, Wackiness Ensues (which she informed me sums up her life as an artist, wife, mom) for some great mini-interviews with other artists. Had I encountered illustrations like Gretchen’s as a child, I might have forced my legs to stop their never-ending locomotion. I might have settled down long enough to read a picture book (when I say “read” here, of course, I mean look at the pictures). In addition to the richness of color and the wonderful details, there’s also something special about the diverse styles and varied tones (as in moods – from elegant and refined to whimsical and playful) of her work. Surprising to me, given the colorful nature of her work, yet something that seems a common sentiment with many artists, Gretchen has a love/hate relationship with color. The response I hear most to this question involves a deep respect similar to what you might expect to find an apprentice having for a mentor from whom he/she is constantly learning about craft and about him or herself. To get a better feel for Gretchen and her work, visit Where Monsters Meet (which reflects her humorous side). 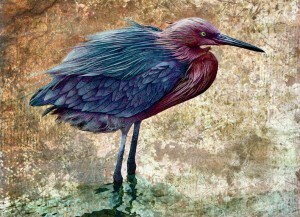 Then click on her cool bird, “Patterned Egret,” for a look at her more serious side. I think some people are just meant to cross paths. Take me and artist Laura Charles for example. We only just met two weeks ago, but I feel like we have so much in common. One thing is certain, I connected with her illustrations and her sketches right away. I was looking for someone to teach me drawing and found Laura through a few local Arts venues. Turns out she works for The ARTS Council for the Southern Finger Lakes where I’m a member, and we’re both members of the Society of Children’s Book Writers & Illustrators (SCBWI). As a matter of fact, it’s her “deep-rooted love of story and all the different ways it can be communicated” that compel her to create art. I’m looking forward to my drawing classes with Laura, I believe it will help me create my literary characters more fully. I also look forward to watching her career unfold. I find her work inspiring in so many ways.